Recent advances in air pollution sensor technology are generating some surprising benefits. The rising number of chronic diseases linked to poor air quality has brought to light the severity and urgency of air pollution - the cause of 8 million early deaths worldwide each year. With 92% of the global population living in areas that the World Health Organization (WHO) deems as exceeding safe air pollution levels, there is a pressing need to better understand air pollution. As the former mayor of New York City Michael Bloomberg once said about air pollution: “If you can't measure it, you can't manage it and you can't fix it.” Recent innovation in low-cost pollution sensors has enabled a new generation of air quality monitoring that provides actionable high-resolution data at a fraction of the cost of traditional monitoring systems. We’re now able to see clearer than ever, real-time snapshots of where air pollution is coming from and traveling to, and who is most affected. Equipped with this knowledge, we can work together across different levels of interest to settle the tensions between social good and economic growth, ushering in a new epoch of healthy communities and prosperous cities - and in doing so, building a new and sustainable framework of clean air investments and policies within the context of the Fourth Industrial Revolution. High-resolution air quality data act as metrics to implement and evaluate new traffic management policies. 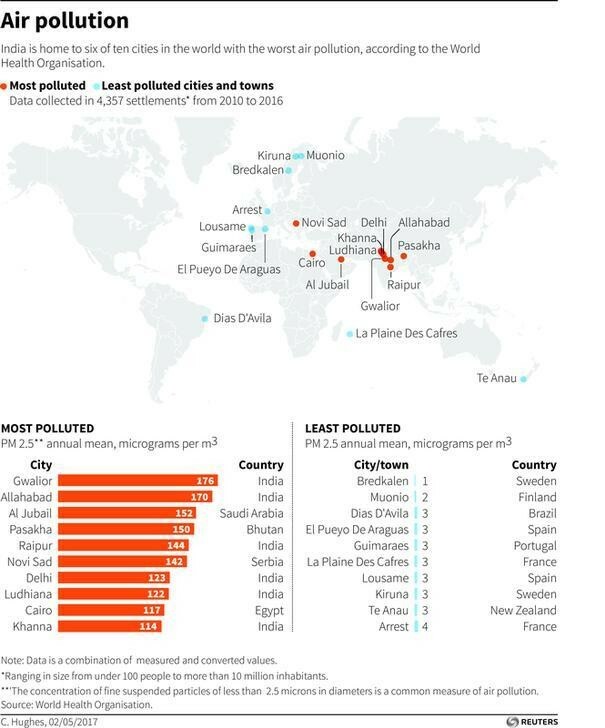 By deploying air quality monitors along busy roads and intersections, cities can track pollution trends and hotspots - the routes and times of the day with the highest concentration of pollutants - to refine their policies accordingly. Real-time air pollution data on the most congested streets can be seamlessly integrated into local traffic data to develop smart traffic controls and minimize congestion. The benefits are exponential - less traffic, less time on the road, less air pollution exposure, and all the perks that come with improvements in quality of life. The World Bank released a joint report with the Institute for Health Metrics and Evaluation revealing that air pollution cost the global economy $225 billion in 2013 - and that’s lost labor income alone. Aside from the responsibility industry has towards their employees and neighboring communities, air quality monitoring helps big polluters take appropriate actions to increase the productivity of their workers. Are smart mini sensors the next big thing in tech?